← Machines at War 3 – Limited Time Sale During Pre-Order Beta! Go buy Drox Operative now! There, I said it. I’m breaking both format and formula, and I’m going to start this review in reverse. Perhaps I should explain why Drox Operative is so good instead, then you can decide whether it’s your type of game or not. Or perhaps you should just go download the demo, enjoy the gameplay, and then buy it. Yes, that is what you should do. The only people I can’t see enjoying a game like Drox Operative are non-gamers, or the type of individual who only plays casual games such as Solitaire, Mahjong, or Bejeweled (not that there’s anything wrong with that!). One thing’s for certain, you simply can’t consider yourself a “gamer” if you can’t find it in your gamer heart to enjoy at least some of the gameplay and elements found within this epic sci-fi starship action and RPG game. You play as a Drox Operative. Some call your kind mercenaries, others describe you as elite soldiers who operate from the shadows. Then there are those who recognize the Drox Operative guild as the deciding factor in any war that is waged. As one of these operatives you decide whether you’ll become an agent of peace, hope, and prosperity, or dominate entire star systems as a harbinger of death and doom. Your skills and talents are unsurpassed. However, will you live long enough to bring order and harmony to the galaxy or would you rule through a reign of terror and destruction by laying waste to all those who would cross you? Drox Operative contains a simple story setup that launches you right into the game. Though there is a beginning and an end to the game and the overall story, it’s everything that happens in between that matters most of all. The story is merely a backdrop and the reason behind why you do what you do. Given the robust amount of options and play styles available, you can make this space opera play out almost any way you wish. You may choose to play as a gallant space rogue, a peace keeping privateer, or a mercenary of darkness. You’re given the freedom to play as any and in every way possible, right from the get go. There are multiple races to choose from, each with their own ship types and starting feats. Some races are more geared toward expansion through treaties and good relations, while other races are war mongering and seek total control. No matter which race you choose, Drox Operatives are loyal to no one. Your only job is to pick the winning side in this space race and help them conquer the galaxy while raking in as many credits as possible. You’ll also want to have the deadliest ship in the galaxy. Not many people would screw with a Drox Operative captaining a Dreadnaught! Gameplay in Drox Operative is a combination of simple controls and deep mechanics. It’s easy to compare the gameplay to other Action / RPG’s such as Diablo or Torchlight, and you wouldn’t be far off if you thought the game contained some of the sci-fi goodness found in other great space games such as Elite, Privateer, or EV Nova. And while Drox Operative is as good as, if not better, than all of those it is also a deeper experience. Where Diablo is a straight up Action / RPG, Drox Operative goes further by including a wide range of diplomatic options that never outshine or interfere with the action or the role-playing. Controlling your ship is done simply by pointing the mouse in the direction you want to go and then clicking which kicks in the thrusters. Combat is handled in a similar way. 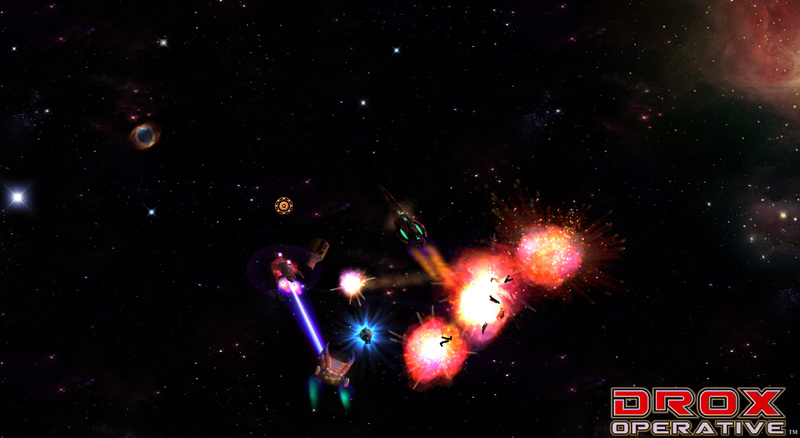 Depending on the weapons you have equipped, simply aim at the enemy ship you want to target and click on it with the left (or right) mouse button. It’s an intuitive and user friendly interface. This is very much a pick-up-and-play type of game and Drox Operative also includes an easy to understand Hint/Tutorial system that can easily be turned on or off. Completing quests and gaining XP will allow you to rank up your stats which also allow you to equip more powerful components and weapons or captain a bigger and better ship. The speed, weapons, energy, hull integrity, and overall status of your ship are affected by the components and crew you have equipped. Speaking of which, bigger ships are earned automatically by raising your command points, so if you plan on owning the best ship and having the best components to go with it then be prepared to spend a lot of time doing quests, defeating enemies, and leveling up! Conversely, you could finish the game with your starting ship if you wanted. When you’re not exploring the galaxy, scanning unknown planets, completing quests, jumping from system to system, or battling fierce enemies, you can try your hand at diplomacy. The diplomacy screen is where you’ll handle your relations between each of the races you’ve discovered. This is where you can form a non-aggression pact, ally with other races, declare war, trade technology for allegiance or money, or even demand compensation. The diplomacy system is so deep in fact that you can manipulate each of the races into declaring war on one another or have them form a truce and protect one another. Each race does have it’s own behavioral patterns so convincing them to sign a treaty might take a different approach from one race to the next. As with any great Action / RPG, the loot drop remains the most addictive aspect of this game type. You literally have the option of outfitting your ship with thousands of different components. Some of this loot can be purchased from space merchants or traded on planets. You’ll also get random loot drops and credits from the enemies you destroy. Scanning and searching derelict ships or space junk can also prove to be rewarding when it comes to loot. On top of the benefits that these components can bring you’ll also encounter space anomalies which behave like buffs for your ship. It’s important to note however that some of these buffs can be detrimental to ship performance, so take heed when scanning these anomalies. Last but not least, on top of the single player campaign, Drox Operative offers a multiplayer co-op experience over both LAN and online. Partnering up and exploring the galaxy with a friend can be a blast and it adds a fair bit of play value to the overall experience. More importantly though, every game offers a brand new experience due to the fact that the sector is randomly generate. This means that Drox Operative offers near limitless replay value. Their are a handful of ways to win the game. By allying with the last living race, making all other races fear the Drox guild, or solving the most noteworthy of quests and defeating the most powerful space monsters, you can meet the win conditions by becoming a legend. On the other hand can lose the entire game if one race manages to conquer the entire sector and you are not allied with them, or if you end up at war with all the remaining races. Drox Operative features some great graphics. This is a 2D top-down isometric Action / RPG and the graphics are perfectly suited for the sci-fi space theme and setting. Aside from the varied and cool looking ships, there are a number of excellent little graphical effects that bring the galaxy to life. Each new sector you visit has it’s own graphical background which might only feature a simple display of stars or a vibrant and colorful nebula. The planets in these sectors are detailed and the ships belonging to each race are uniquely designed. Every weapon type has its own explosive display of goodness as well. Everything from beam type weapons, ballistic cannons, to nuclear missiles, Drox Operative provides a spectacular light show that rivals the average fantasy based Action / RPG. The music and sound effects are more subtle but no less impressive. The music provides the perfect background for the space setting, while the sounds of lasers blasting, mines exploding, and a flotilla of enemy ships soaring in for the kill help to create the desired amount of tension and thrill. Whoever said there was no sound in space obviously never played a videogame! I think it’s easy to see that Drox Operative is a game that I thoroughly enjoyed and will continue to enjoy for quite a long time. With it’s almost unlimited replay value, the randomly generated galaxy, and co-op mode, this is one Action / RPG that should appeal to all Action / RPG fans. If you’re a gamer simply looking for a great new game to play then you should definitely check out Drox Operative. There are a number of difficulty levels to choose from allowing the game to be approached even by casual gamers. Veterans of the genre will be pleased to know that you can ramp the difficulty up to a point where even the most hardened gamer will find it challenging. You can also adjust the size of your galaxy at the beginning of a new campaign which means you could potentially create a game that lasts as long as 20 or more hours or as little as 1 or 2 hours. You’ll probably die numerous times before you learn all of the little nuances within Drox Operative but along the way you’ll have a lot of fun along the way. There are numerous achievements to unlock that further add to the games replayability. Drox Operative is one of those games that is well worth the price of admission and achieves that perfect bang-for-buck ratio. Head over to the Drox Operative website and see for yourself why it’s such a fantastic addition to the action / rpg genre. Drox Operative is available for both PC and Mac users and I highly encourage you to download the playable demo. Give the game an hour and I’m sure you’ll want to buy the full game! Edit: Don’t forget to upvote Drox Operative via Steam Greenlight.